The Need for Speed 2019 study compares Excel Add-in based modeling using @RISK and Crystal Ball to programming environments such as R and Julia. All 3 aspects of speed are covered [time-to-solution, time-to-answer and processing speed] in addition to accuracy and precision. Imagine playing a game in which someone asks you to infer the number of sides of a polyhedron die based on the face numbers that show up in repeated throws of the die. The only information you are given beforehand is that the actual die will be selected from a set of seven die having these number of faces: (4, 6, 8, 10, 12, 15, 18). Assuming you can trust the person who reports the outcome on each throw, after how many rolls of the die wil you be willing to specify which die was chosen? Whether you are a businessman or a practicing professionals such as an attorney, a doctor or a consultant, the ability to ask the right questions is imperative along with the ability to capture the information that is important when an answer is provided. Sometimes knowing where to start is the toughest aspect of solving a problem. Usually a sound approach is breaking out complex problems into smaller more manageable components; as the old adage goes “Do you know how to eat an elephant? One bite at a time!” Check out how to break-down tough problems by following the simple 5W question framework. Will machine learning be the dominant technology focus over the next 2 years? While doing some market analysis, we decided to take a look at how search terms were being used in Google around the world as they related to advanced analytics technologies. We picked five terms to compare over five years: risk analysis, big data, machine learning, Monte Carlo method, and forecasting. We then proceeded to download the data and apply some quick and dirty forecasting to see what would happen to the popularity of the search terms overtime. Many speak of organizational alignment, but how many tell you how to do it? Others present only the financial aspects of portfolio optimization but abstract from how this enables the organization to meets its business objectives. We are going to present a practical method that enables organizations to quickly build and optimize a portfolio of initiatives based on multiple quantitative and qualitative dimensions: Revenue Potential, Value of Information, Financial & Operational Viability and Strategic Fit. This webinar is going to present these approaches and how they can be combined to improve both tactical and strategic decision making. We will also cover how this approach can dramatically improve organizational focus and overall business performance. 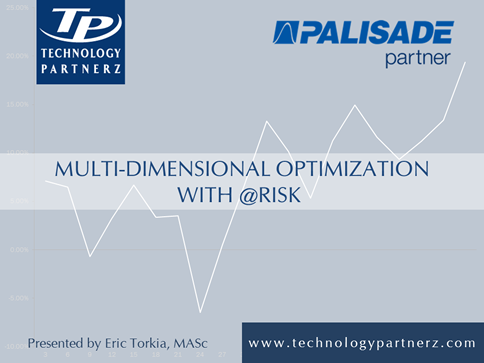 We will discuss these topics as well as present practical models and applications using @RISK.